No more "best without a bracelet" for E-Dog! After numerous WSOP cashes and final table near misses, Erick Lindgren has finally claimed his first WSOP bracelet, outlasting 331 others to win this year's Event No. 4, the $5,000 Mixed Limit/No Limit Hold'em event. The night started on the right foot for Lindgren when he knocked out ninth-place finisher Isaac Haxton on the second hand of the final table. Lindgren continued to build his stack from there. When heads up began, Justin "ZeeJustin" Bonomo had a 3-to-2 chip advantage over Lindgren. After holding steady through the initial no-limit round of play, Lindgren began taking sizable pots off of Bonomo in the limit round. 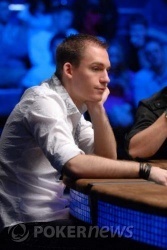 Then, in the 40th hand of heads up, Lindgren finally claimed the last of Bonomo's chips and the bracelet was his. This was an ESPN televised final table, so Norman Chad has just conducted an interview with Lindgren from behind the enormous stack of cash collected on the table. Chad asked Lindgren if he was worried about perhaps never winning a bracelet. "It was really on my mind," answered Lindgren. "Until the final card turned, I was worried that he would come back." Lindgren added some complimentary words about Bonomo. They chatted a bit about young phenoms like the 22-year-old second-place finisher. Then Chad, pointing out that Lindgren was past age 30, asked him if perhaps he thought his best years of poker were behind him. "Are you kidding me?" answered Lindgren incredulously. "Doyle thinks his best years are ahead of him!" They are shooting photos of Lindgren and his winning hand. That's one genuine smile he's got going there. All in all a very memorable night from the Rio. 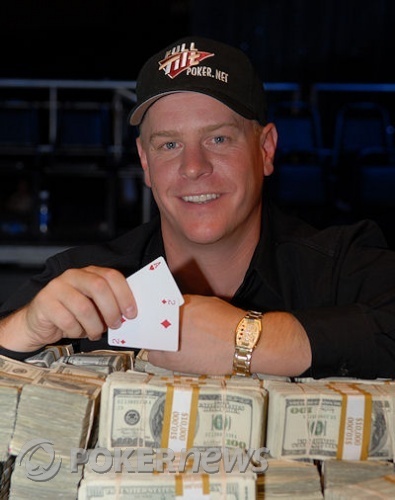 Hand #197: Erick Lindgren Wins! Justin Bonomo has the button. Erick Lindgren raised to 80,000. Justin Bonomo called. The flop was . Both checked. The turn was . Bonomo bet 80,000 and Lindgren called. The river was . Bonomo bet and Lindgren raised. Bonomo is all in and Lindgren called! Lindgren had for the turned straight. Justin had for two pair. And that is it! Justin "ZeeJustin" Bonomo finished in second place for $230,159! 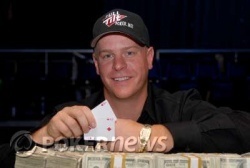 Erick "E-Dog" Lindgren got $374,505, but much more importantly, his much sought after first WSOP bracelet. Finally, Lindgren can join the ranks of the World Series of Poker bracelet winners. Now, what will he do for an encore? Bonomo raised from his button, and Lindgren folded. Erick Lindgren has the button and Justin Bonomo gets the walk. Justin Bonomo has the button. Bonomo raised to 80,000. Lindgren folded. Lindgren raised from the button, and Bonomo called. The flop was . Bonomo checked, Lindgren bet, Bonomo raised, and Lindgren called. The turn was the . Bonomo bet, and Lindgren called. The river was the . Bonomo bet, and Lindgren paused a moment, grimacing. Then he called. Lindgren showed a pair of sevens, and Bonomo mucked. Justin Bonomo has the button and Erick Lindgren gets a walk. Justin Bonomo has the button. Bonomo raised. Lindgren called. The flop was . Lindgren checked. Bonomo bet. Lindgren folded.